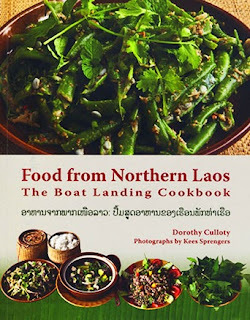 This is my newest favorite cook book on Lao food. It's been out since 2010 and if you haven't bought a copy yet, definitely get one. It's beautifully photographed by the author's husband Kees Springer with over 400 color photographs adorning this book. That alone makes it arguably one of the most visually appealing Lao cookbooks out on the market along with its glossy 200 pages. Equally important of course is that this books comes with some very interesting recipes including, surprisingly, jaeow mang da (water beetle sauce). Surprised because typically westerners shun the idea of eating insects. However, she succinctly describes it in a way that would make you drool, saying: "It is difficult to dream that an insect could taste so heavenly, but it does! The perfume from the beetle's gland permeates this condiment with roasted chilli and garlic." I would add that the beetles also add depth, body and a bit of thickness to the sauce. The book is organized in a very methodical way. First by introducing you to the those that created the book and how it all came about, as well as background on The Boat Landing Guesthouse and Restaurant. Then it goes on to tell you about the some of the ethnic groups in Luang Namtha province and background information on Lao meals, ingredients, utensils and tools and tips for Lao cooking. The parts that follow are of course the essentials - the recipes and there's plenty of them. Admittedly, food in Laos definitely has its regional tastes and uniqueness but there's also similarities with many dishes like lap (meat salad) for example. Dishes from northern Laos can be characterized in this manner as well. You'll find some interesting gems or recipe variations you may not have known, for example egg omelette with acacia fronds (ky jeun sy pak la) or fried seaweed chips (ky paen jeun). Additionally, she's written recipe names in both English and Lao along with some ingredients and other words receiving translation as well. However please note this is not a fully bilingual (Lao/English) book - it is primarily in English. If ordering the book from online you can use Amazon for American buyers, White Lotus Press for those in Asia. All other buyers, including Canadians, will have to buy from the publisher's website. You'd be surprised but there are some people selling used copies of this book online for helluva lot more than what you'd have to pay for buying it directly from the publisher or from one of their official resellers. At under $30 it's definitely worth buying! It'd be a wonderful addition to your home library. Full table of contents shown below for your interest.